Best Seller!!! 15ft Garage 2500lb rated flush mount tie downs! Has 3 Season Wall in Garage! The Solitude is built to a higher standard! With a true 101" wide body design and 10" drop rail for storage you won't be dissappointed in this model! King Bed! Still our #1 selling bunkhouse! With tons of exterior storage and a well designed interior with tons of little upgrades and details you will love it's style! Designed to be beautiful and roomy. This unit has a rear living room. 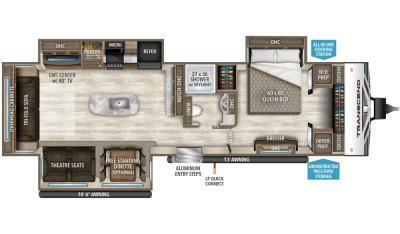 New Floorplan from Grand Design! This RV has unbelievable counter-space with direct viewing for the TV with theater seating! New Floorplan!! !3 Slide 5th Wheel Bunkhouse! Check out the new Mid-Bunk model with Auto Level Jacks, Solid surface counter-tops and more! New Bunkhouse Floorplan! The triple bunk model has all the upgrades! Huge TV with direct viewing, Tri-fold sofa to accommodate more sleeping. Check out this terrific floorplan made for couples! A rear kitchen model with TV, fireplace, 2 door entry and more! 3 Slides with Island Kitchen! Has a 4 Door Refer with Pantry and a deep stainless steel sink! The storage in the Front Bedroom is Massive! 1/2 Ton Towable 5th Wheel With Bunks! Only weighs 8,192lbs! Comes with 2 A/C's and 50Amp Service! 3- Slides with Island Kitchen- 2 Awnings-Ktichen Pantry-Table & Chairs-and Huge master bedroom with massive amounts or storage!